EndyMed3DEEP uses radiofrequency technology to firm, tighten and lift sagging skin on the face and body by heating the collagen in the dermis. How is Endymed 3Deep different from other technologies? 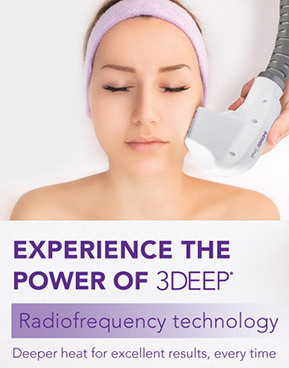 The radiofrequency technology used by the 3DEEP applicators differs from traditional radiofrequency techniques in that it is very controlled, allowing the practitioner to deliver targeted energy to the collagen. One of the benefits of the Endymed Radiofrequency technology is that it can be used safely in all skin types and skin pigmentation. The radiofrequency energy penetrates deep within the dermis to heat the tissues and produce an increase in tissue volume. The Endymed 3DEEP technology can be used safely to treat any area on the body but is most commonly used for the face, neck and abdomen. According to your treatment program, our office will recommend a series of treatments, up to six, in intervals of one to two weeks. You should start to see improvement in your skin following the second treatment and additional improvement will gradually appear as the treatment course progresses. The energy from the heat delivered to the collagen causes it to shrink, which immediately alters the appearance of skin, while also triggering the production of new collagen. This collagen remodelling helps to make the skin look younger and firmer, tightening loose or lax skin and improving tone and texture. Improvement in the quality of your skin following EndyMed 3DEEP treatment should be long-lasting, provided that you maintain a healthy lifestyle and undertake regular exercise, alongside a healthy diet. You should also use adequate sun protection and maintain a proper skin care regimen.